Announces the public preview of Transparent Data Encryption (TDE) with Bring Your Own Key (BYOK) support for Microsoft Azure SQL Database Managed Instance. Azure SQL Database Managed Instance is a new deployment option in SQL Database that combines the best of on-premises SQL Server with the operational and financial benefits of an intelligent, fully-managed relational database service. TDE with BYOK support has been generally available for single databases and elastic pools since April 2018. TDE with BYOK support is offered in addition to TDE with service managed keys which is enabled on all new Azure SQL Databases, single databases, pools, and managed instances by default. Announces a public preview of a new feature in Azure SQL Database, both in logical server and Managed Instance, called CLUSTERED COLUMNSTORE ONLINE INDEX build. This operation enables you to migrate your data stored in row-store format to the columnstore format and maintain your columnstore data structures with the minimal downtime on your workload. Learn why this format is valuable and how it can compress data and boost the performance of your analytical queries. This feature is currently in preview in all flavors of Azure SQL Database including logical servers, elastic pools, and Managed Instances. Virtual Networks and Firewall rules for both Azure Event Hubs and Azure Service Bus are now generally available. This feature adds to the security and control you have over your cloud environments. Now, traffic from your virtual network to your Azure Service Bus Premium namespaces and Standard and Dedicated Azure Event Hubs namespaces can be kept secure from public Internet access and completely private on the Azure backbone network. Customers dealing with PII (Financial Services, Insurance, etc.) or looking to further secure access to their cloud visible resources will benefit the most from this feature. An internal Microsoft project, known as Trill, is for processing “a trillion events per day” is now being open sourced on GitHub to address the need to process massive amounts of data each millisecond is becoming a common business requirement. Trill started as a research project at Microsoft Research in 2012, and since then, has been extensively described in research papers. The roots of Trill’s language lie in Microsoft’s former service StreamInsight, a powerful platform allowing developers to develop and deploy complex event processing applications. Both systems are based off an extended query and data model that extends the relational model with a time component. By open-sourcing Trill, we want to offer the power of the IStreamable abstraction to all customers the same way that IEnumerable and IObservable are available. Trill powers internal applications and external services, reaching thousands of developers. A number of powerful, streaming services are already being powered by Trill, such as Bing Ads, Azure Stream Analytics, and Halo. Bot Framework SDK version 4.2 is now available. The team used this opportunity to provide additional updates on Conversational-AI releases from Microsoft. In the SDK 4.2 release, the team focused on enhancing monitoring, telemetry, and analytics capabilities of the SDK by improving the integration with Azure App Insights. As with any release, we fixed a number of bugs, continued to improve Language Understanding (LUIS) and QnA integration, and enhanced our engineering practices. There were additional updates across the other areas like language, prompt and dialogs, and connectors and adapters. Az is a new Azure PowerShell module that is built to harness the power of PowerShell Core and Cloud Shell and maintain compatibility with Windows PowerShell 5.1. Az ensures that Windows PowerShell and PowerShell Core users can get the latest Azure tooling in every PowerShell on every platform. Az also simplifies and normalizes Azure PowerShell cmdlet and module names. Az is open source and ships in Azure Cloud Shell and is available from the PowerShell Gallery. The Az module version 1.0 was released on December 18, 2018, and will be updated on a two-week cadence in 2019, starting with a January 15, 2019 release. The Developer Economics Q4 2018 survey is an independent survey from SlashData, an analyst firm in the developer economy that tracks global software developer trends. Every year more than 40,000 developers around the world participate in this survey, so this is a chance to be part of something big, voice your thoughts, and make your contribution to the developer community. The Developer Economics Q4 2018 survey is for all developers (professionals, hobbyists, and students) engaging in the following software development areas: web, mobile, desktop, backend services, IoT, AR/VR, machine learning and data science, and gaming. As 2018 draws to a close, the IoT Team took a look back at the topics that drove the most interest and excitement here on the Azure blog—and a window into what’s coming for this technology in the near future, covering everything from smart spaces, to the intelligent edge, to open standards and interoperability. We’re seeing new ecosystems and solutions emerge that unify data and insights from multiple places to enable new possibilities. As smart cities, vehicles, buildings, spaces, energy, and more converge, the opportunities grow—and so do needs for end-to-end manageability and security. We are committed (in April, we announced our intention to invest $5 billion in IoT over the next five years) to solve these challenges with built-in connectivity, real-time performance, and security innovation at the intelligent edge. Ricardo Mendes Principal Program Manager, Azure Stack, takes a look at the technology landscape supporting hybrid scenarios and does a retrospective of the myriad announcements throughout 2018 that enabled developers to focus more on building apps and worry less about infrastructure. This year has been amazing for developers that design, develop, and maintain cloud-based apps. Azure Stack has improved support for DevOps practices. You can use Kubernetes containers. You can use API Profiles with Azure Resource Manager and the code of your choice. Learn how you can fine-tune Bidirectional Encoder Representations from Transformers (BERT) easily using the Azure Machine Learning service, as well as topics such as using distributed settings and tuning hyperparameters for the corresponding dataset. In this post, you’ll see some preliminary results to demonstrate how to use Azure Machine Learning service to finetune the NLP models. After BERT is trained on a large corpus (for example, English Wikipedia), the assumption is that because the dataset is huge, the model can inherit a lot of knowledge about the English language. In addition to tuning different hyperparameters for various use cases, Azure Machine Learning service can be used to manage the entire lifecycle of these kinds of experiments. Azure Machine Learning service provides an end-to-end cloud-based machine learning environment, so customers can develop, train, test, deploy, manage, and track machine learning models All the code is available on the GitHub repository. Azure Sphere is an end-to-end solution containing three complementary components that provide a secured IoT platform. They include an Azure Sphere microcontroller unit (MCU), an operating system optimized for IoT scenarios, that is managed by Microsoft, and a suite of secured, scalable online services. Broadly, any MCU-based device belongs in one of two categories – devices that may connect to the Internet and devices designed to never connect to the Internet. Connecting an MCU-based device to the Internet is a watershed moment because any MCU can become a potential general-purpose digital weapon in the hands of an attacker. Learn how Azure Sphere-certified MCUs go beyond a typical hardware root of trust used in an MCU. This post discusses what puts the “secured” in a secured Azure Sphere MCU. Specifically, the Pluton Security Subsystem design details, as well as some other general silicon security improvements. As noted above, the Azure PowerShell team released Az, a new cross-platform PowerShell module that will replace AzureRM. You can install this module by running Install-Module Az in an elevated PowerShell prompt. With the introduction of PowerShell Core, PowerShell is a cross-platform product. Therefore, it became a priority for Azure PowerShell to have cross-platform support. Because of the changes required to support running Azure PowerShell cross-platform, we created a new module rather than modifying the existing AzureRM module. Moving forward, all new functionality will be added to the Az module, while AzureRM will only be updated with bug fixes. In this post, you’ll learn how to migrate from AzureRM to Az in Azure PowerShell. I wrote this post, which covers three free resources every developer needs for learning Azure. Dan Fernandez leads the team responsible for bringing our technical documentation and learning resources into a more modern experience that supports new capabilities that were impossible to deliver via MSDN. 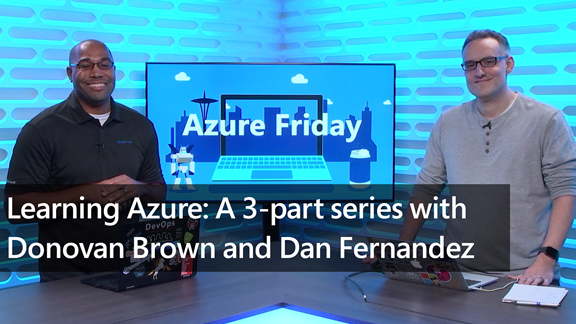 Recently, I invited Dan to record a few episodes of Azure Friday with Donovan Brown and spend some time showing off the work his team is doing to provide the best doc and learning experience. There are several "Dos and Don'ts" you can follow to make your query run faster. Yossi Yossifon, Senior Program Manager on Microsoft Azure, provides some best practices for Log alerts rules queries in Log Analytics and Application Insights. Check his post for a few tips and a link to the query best practices in the Azure documentation. Azure Data Explorer (ADX) is a lightning-fast indexing and querying service helps you build near real-time and complex analytics solutions for vast amounts of data. ADX can connect to Power BI, a business analytics solution that lets you visualize your data and share the results across your organization. The various methods of connection to Power BI enable interactive analysis of organizational data such as tracking and presentation of trends. Learn the various ways to query data from Azure Data Explorer to Power BI. Additional connectors and plugins to analytics tools and services will be added in the weeks to come. Storytelling is at the heart of human nature and Natural Language Processing is a field that is driving a revolution in the computer-human interaction. That is why we decided to explore AI Pix2Story to see if we could teach an AI to be creative, be inspired by a picture and take it to another level. Learn about how to connect other IoT clouds like Sigfox, Particle, and The Things Network to IoT Central with the IoT Central device bridge open-source solution. We'll talk about what the device bridge is and how it works, and demo a device connected to The Things Network use the device bridge to connect to your IoT Central app. Learn how to create a container based on an image, and then create a running app inside of it. 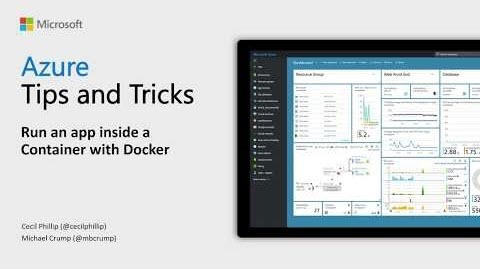 Once you get set up with Docker on your local dev machine by installing the Docker desktop application for your operating system, you can easily run an app. Jeffrey Palermo and Chris Patterson, Principal Program Manager at Microsoft, discuss how the infrastructure of Azure Pipelines is changing, what a build will mean in the future, the goal of Azure Pipelines evolution, and more. Fintech start-up and Microsoft partner clearTREND Research had a plan was to commercialize a financial trend engine and provide a subscription investment service to individuals and professionals. Learn how their reasons for choosing Azure Cosmos DB as the best solution that could adapt, evolve, and enable their business to innovate faster in order to turn opportunities into strategic advantages. You’ll also get some tips from the clearTREND team to consider when designing and implementing a solution with Azure Cosmos DB. The team that designed and implemented the clearTREND solution are architects and developers with Skyline Technologies. For in-depth insights around the latest developments in IoT for retail, including how customer expectations are changing and how IoT investments can impact store profitability, you can register for a live IoT in Action event in New York (co-located with NRF 2019) on January 14, 2019, or sign up for our industry-specific retail webinar on January 8, 2019. You will get insights into how IoT can help you delight customers, improve the effectiveness of your associates, and increase the efficiency of your operations. You can also take a deep dive into building retail IoT solutions at our upcoming 2-day Virtual Bootcamp in late January and early February. The Azure Marketplace is the premier destination for all your software needs – certified and optimized to run on Azure. Find, try, purchase, and provision applications &amp; services from hundreds of leading software providers. You can also connect with Gold and Silver Microsoft Cloud Competency partners to help your adoption of Azure. In the second half of November, we published 80 new offers. 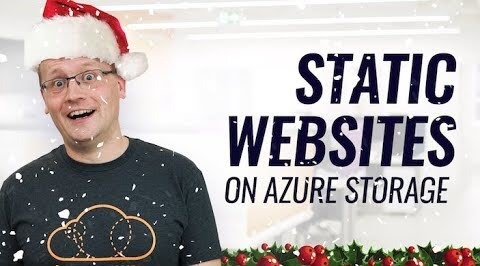 In this Christmas special edition of Azure This Week, Lars talks about static websites on Azure Storage now being generally available, the preview of neural network text-to-speech with Jessa and Guy, and some more serverless Azure news with Azure Functions.